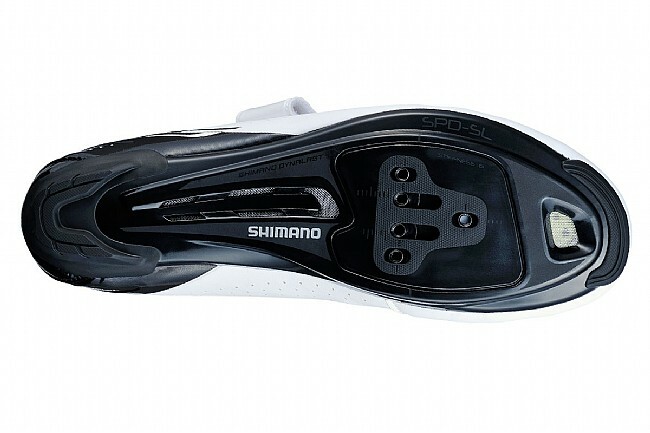 The Shimano SH-TR5 Tri Shoes provide comfort and performance inspired by the higher-end TR9 triathlon shoe. Comfort is foremost for the long cycling leg of a race, so the TR5 uses a perforated synthetic upper and 3D mesh interior for excellent breathability. Dynalast construction puts the foot the prime position for optimum pedaling efficiency, and the fiberglass-reinforced nylon sole blends stiffness and compliance. To aid in transitions, a T1 Quick Strap is fast to adjust and can be trimmed to the rider's desired length, and an asymmetrical pull tab stays open so it's easy to reach without fumbling. Compatible with three-bolt road cleats or two-bolt mountain cleats. Claimed weight is 265 g (size 42). 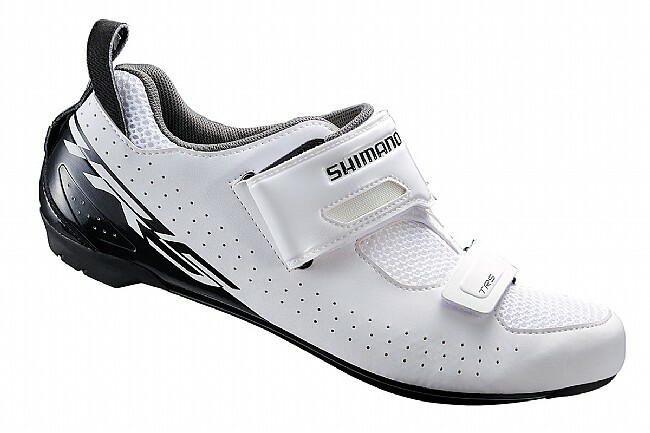 great deal for triathlon shoe. the strap is long, but it is easy to leave your shoe loose, slip in when you mount, and then tighten the strap. Fit is very comfortable. Easy velcro closures that make for easy adjustment. About the most well ventilated shoe around. Comfortable, stable and easy to get in and out of quickly. Shimano quality throughout. Small detail of the upper velcro closure that pulls inboard. Would prefer an outboard pull many reasons. Otherwise it would be a 5 rated shoe.